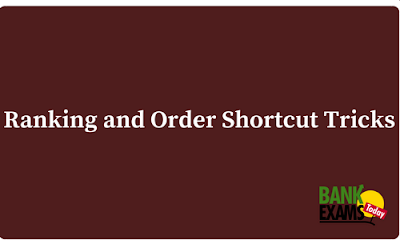 Rank and order is an important point from the bank exam. In order and ranking questions, you have to find out the position of a person from left to right or from top to bottom. Now, let's discuss each different case in Rank and Order. In this question, the below formula is used. Total no of persons= Left position in the line + Right position in the line-1. A is 25th from the left and 32nd from the right, find out the total no of persons in the line. Total no of persons = Left position in the line + Right position in the line-1. A's position from the top is 17th and the persons behind A are 7. Find out total no of persons in a raw. 3) When total no persons and position of two different persons given from the opposite. Find out no of persons between this two persons. There are 58 persons in a row, in which A is 11th from the left and B is 22nd from the right side of the row. Find out no of people between A and B. There are 50 persons in a row, in which A is 24th from the left and B is 30nd from the right side of the row. Find out no of people between A and B. 4) If persons interchange their positions in a row and the interchange position of one person given. In a row A is 11st from the left and B is 18th from the right, after interchanging their positions A becomes 29th from the left. Find the total no of persons in a row.